When Savannah Dream Vacations gave me the opportunity to stay in their Huntingdon House vacation rental, I already knew what to expect from the “invisible” support staff. Everything was in order, the temperature was set for us upon arrival, and the place was immaculate. What I didn’t expect, was how much outdoor space we found! The Huntingdon House has shaded balconies on the front, side, and rear of the home. The property also has a lush, private courtyard on the side, and gardens in the rear! The weather in downtown Savannah was perfect for enjoying all the outdoor space, but we wanted to explore the inside of the house. Built in 1900, the Huntingdon House vacation rental is only a block-and-a-half or so from the Forsyth Park fountain, in the West Forsyth Park neighborhood. The first floor sitting room has a huge flatscreen TV, and plenty of comfortable seating, but the best feature of the room, is the large windows and doorway opening onto the private outdoor space. We enjoyed leaving the door open, feeling the breeze blow inside, and it was so awesome to have what is basically an indoor/outdoor room. The kitchen is super modern, with solid surface counter tops, all new cabinetry, and new appliances. We had planned to eat dinner inside the home, but one of the large, open balconies has a dinette. So instead, we had a charming dinner up in the air under a canopy of trees! The outdoor space was so inviting, and so much fun, that we abandoned our plans to go out, and stayed outside for hours. It’s a little like having a tree house up there! We talked and played cards, we sipped coffee, and ate too many snacks. The Huntingdon House vacation rental is within close walking distance of Forsyth Park, The Mercer-Williams House, Monterrey Square, and the Crystal Beer Parlor on Jones Street. In fact, hopped-up on coffee, we discovered that we had a perfect view of the Fosyth Park fountain, down Huntingdon Street. We walked two minutes down the street and ended up at the fountain. A stroll around the walkways that make up the outer borders of Forsyth Park, left us feeling better after eating too much, and we wandered a block down Bull Street to see the Mercer-Williams House, and Monterrey Square lit up at night. Feeling energized from our exploration on foot, we walked another 3 minutes or so to the Crystal Beer Parlor, a bar and restaurant that was one of Savannah’s first illegal speakeasies during Prohibition. The bar was lively, even though it was 8:30pm on a weekday, and we made new friends over a craft beer or two (or three). We left after about an hour, and walked the three or so blocks back home to the Huntingdon House. The bedrooms and luxury bathrooms are first-rate in the Huntingdon House. You’ll love the home’s two bathrooms, with claw-foot tubs for soaking or showering after a day’s exploring during a downtown Savannah getaway. The house is outfitted with “instant, endless” hot water on-demand, so you never run out of hot water! The beds are oh-so-comfortable, in each of the three bedrooms, with luxury linens for a great night’s sleep. The neighborhood is quiet, and the morning’s coffee and bagels enjoyed on the balcony in the trees, is something to savor. The only bad thing about our stay at the Huntingdon House vacation rental, was that it had to end. I could not recommend this home any more wholeheartedly. The exterior is charming, the interior is tastefully decorated, with modern and historic touches, and the outdoor areas are amazing! 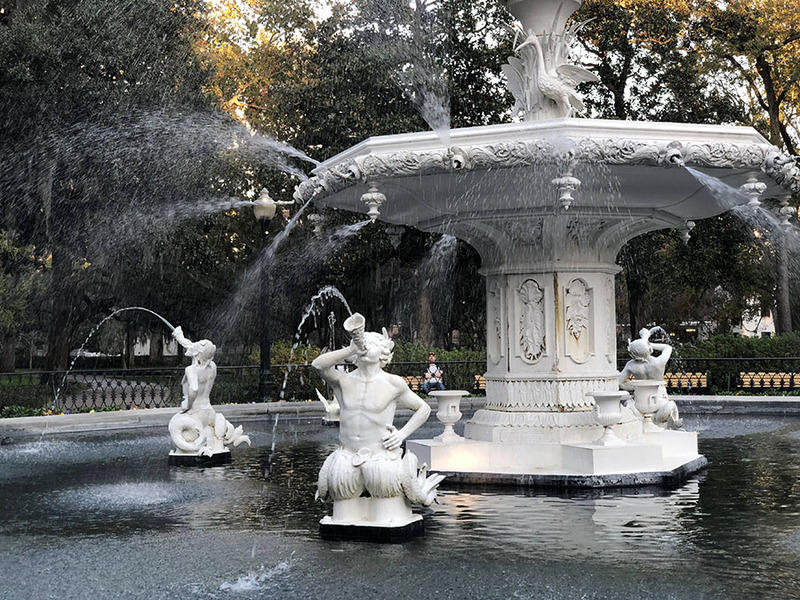 The location is close to many of Savannah’s beautiful parks, squares, and historic homes, and the Savannah Dream Vacations team made sure that everything was perfect for our stay. They’ll do the same for you! The 3 bedroom, 2.5 bath York Street house will delight its visitors with its spacious floorplan, walk in showers and real world decor accompanied by modern touches and sophisticated charm.